Red Bull Arena known as Red Bull Park during construction is a purpose built 25,000 capacity soccer stadium located in Harrison, New Jersey. Curiously, to non-Americans anyway, it is home to Major League soccer side the New York Red Bulls which should technically play in the state of New York! The Red Bull Arena officially opened in March 2010 with the first friendly game held against Santos Futebol Clube, with the Bulls defeating their Brazilian opponents 3-1 in an impressive victory. With planning beginning in July 2004, The Arena perhaps should have opened sooner however changes to the club’s ownership, and negotiations between the governors MLS and the state of New Jersey delayed proceedings somewhat. New York Red Bulls were originally know as The New York MetroStars, and previously played their matches at The Giants Stadium in New Jersey. Originally owned by Anschutz Entertainment Group who also hold large stakes in both LA Galaxy and Houston Dynamo, the MetroStars were purchased and re-branded by Red Bull GmbH in 2006. However, initially Red Bull only agreed a naming rights deal with AEG and were happy to let the entertainment based company run the stadium until they realised that their vision for the arena didn’t match that of their new partners. The biggest bone of contention which resulted in the buy-out by the energy drinks company was that they wished to remove the stage, and replace it with seating whereas AEG wished to retain it. 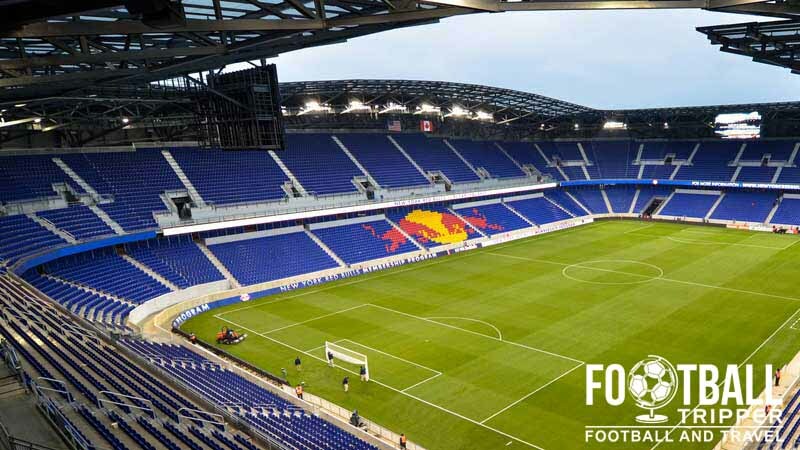 Designed by Los Angeles based Rossetti Architects who also conceived other MLS stadiums such as Toyota Park, Rio Tinto and PPL Park, The Red Bull Arena follows on from the emerging trend of new-style American Soccer Grounds. With a capacity of 25,000 it is the second largest soccer stadium in the MLS as of the 2015 season behind The StubHub Center. 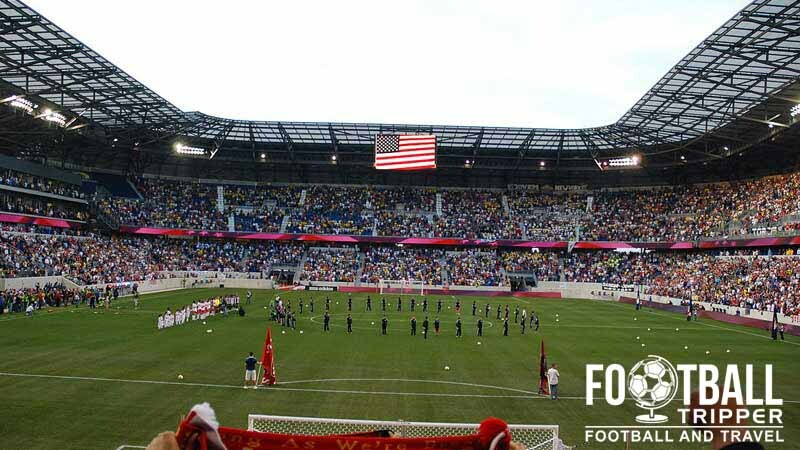 To date, The Red Bull Arena has hosted some high-profile matches such as the 2011 MLS All-Star Game against Manchester Utd, and the 2012 Trophée des champions between French sides Montpellier and Olympique Lyon. Red Bull’s ground has also hosed an international friendly between the U.S and Ecuador and continues to looks to host high-profile matches. The Red Bull Arena is comprised of four stands: North, East, South and West. Within the immediate environs of the arena there is the usual abundance of matchday eating and drinking options, with most alternative options located 10 minutes south of the playing field, across the river. The sports bars are generally located just west, between New Jersey Institute of technology and Newark Penn Station. On campus there is the Kilkenny Alehouse, McGovern’s Tavern and Edison Ale House which serves “American grub and lots of beers on tap”. On Raymond boulevard there is a strip of of restaurant which includes the Catas Spanish restaurant, the Brazilian Boi Na Brasa Bar & Grill and the El Pastor Bar & Restaurant. The Bullshop which acts as the main store for the Red Bulls is located next to the main Box Office within the West Building just off Pete Higgins Boulevard. This store is open to the general public Monday to Fridays between 10.00 am – 4.00 pm, and is the best place to buy your energy drinks and what not. Like a bull in a china shop…like China in a Bullshop. Within the stadium there are also around 10 merchandise stalls strategically scattered around the concourses including one located within the second level of the east side. There is also of course the official MLS online Store as a back up. 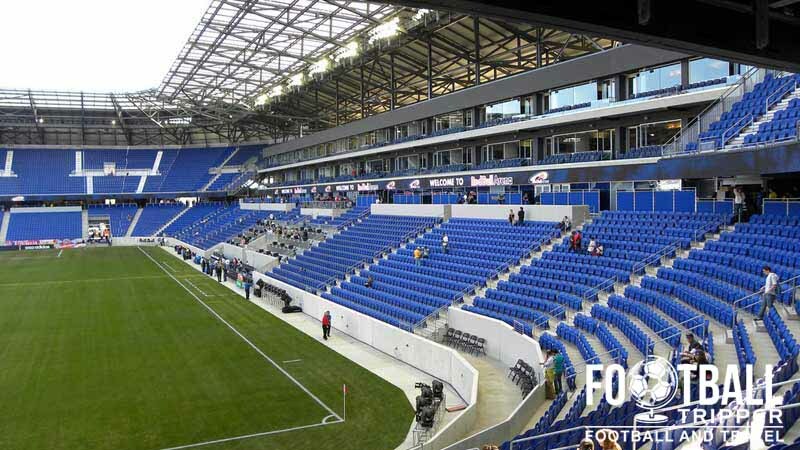 It doesn’t appear as if New York Red Bulls currently offer fans the chance to undertake a tour of the Red Bull Arena but if this ever changes we’ll be sure to update this section. Tickets to see New York Red Bulls play during the 2014 Major League Soccer Season range between $25.00 – $165.00 depending on whereabouts you sit within the stadium. 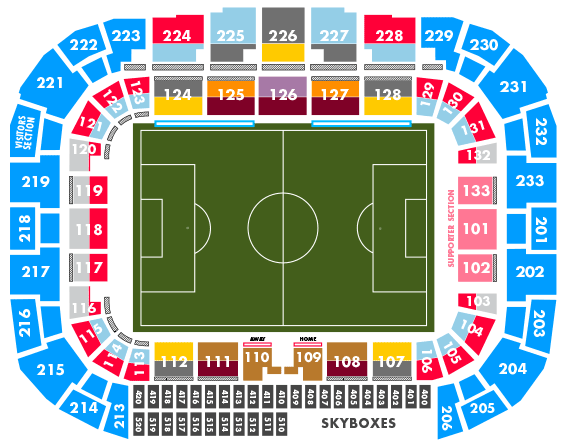 Generally speaking the second tier is cheaper than the lower ring of seating and unlike other stadiums in Soccer, tickets within the corner sections are priced the same as central goal-end seats at around $32.40. Tickets in the lower sections close to the managers dug-outs are on average between $50.00 and $80.00 and are even more expensive for the VIP boxes located above. You can either purchase tickets from the box office or online via the official NY Red Bulls Ticketmaster page. New York Red Bull’s Arena is situated in the Harrison area of New Jersey next to the intersection between Cape May Street and Frank E. Rodgers Boulevard. The Red Bull Arena as seen from across the road. 600 Cape May St., Harrison, NJ, 07029. Parking within the public car parks within the Harrison stadium complex costs anywhere between $7.00 – $10.00 depending on levels of demand, whereas parking locally within Newark is generally more expensive. Please note that Tailgating is not permitted within the Harrison Public parking lots, and instead The Red Bulls have set up the Coors Light Cold Zone as a friendly alternative. This still allows fans to congregate and soak up the pre-match atmosphere. Harrison Station is one of the easiest ways of travelling to Red Bulls Stadium. The Harrison Path Station is located less than 5 minutes from the Arena and offers numerous services to New York City including one from WTC which takes 20 minutes. For a complete timetable and to plan your train journey please visit The Port Authority site. Please note that sometimes this refereed to as Mass Transit. 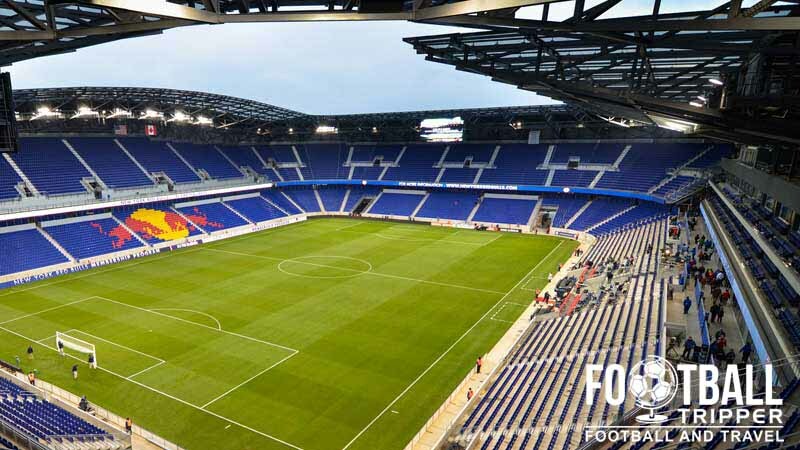 The closest hotels to Red Bull Arena is either the Element Harrison – Newark or The Hilton just outside Penn Station but be prepared to pay a slight premium. The Best Western Plus Robert Treat hotel slightly further north of Passaic River is slightly cheaper.